Gov. 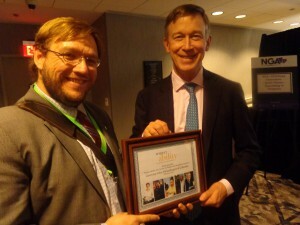 Hickenlooper receives RespectAbility Award for job gains among Coloradans with Disabilities. Washington, D.C., March 13 – As the economy expands, for the first time in decades people with disabilities are gaining jobs, success and independence. According to new data, 14,846 more people with disabilities entered Colorado’s workforce last year. People with disabilities have previously been left out of periods of economic growth, today’s workforce system is better aligned to enable people with disabilities to succeed, just like anyone else. Recently, America’s governors gathered in Washington for the National Governors Association meeting to talk about these and other key issues. Under Governor John Hickenlooper, Colorado now ranks 12th in the nation on jobs for people with disabilities. During the NGA Winter Meeting, RespectAbility took the opportunity to recognize Governor Hickenlooper with an award for the job gains being experienced by people with disabilities in his state. According to RespectAbility, a national organization that fights stigma and advances opportunity for people with disabilities, there are 308,342 working-age people with disabilities living in the Centennial State and 131,658 of them have jobs. With a 42.7 percent employment rate for it’s people with disabilities, Colorado outperforms bigger states such as California, Texas and New York. Governors have a critical role to play as the economy grows and state advance opportunities for citizens of all disabilities. In 2016, Governor Hickenlooper signed SB16-077, making Colorado an Employment First state. This new state law commits state resources to promote competitive, integrated employment, advance best practices for youth with disabilities and to promote postsecondary education including college as well as vocation training. This law, and other initiatives guided bythe Colorado Department of Labor and Employment, reflect what can happen when a state chief executive makes jobs for people with disabilities a key priority. These changes also reflect the types of best practices championed by former Governor Jack Markell of Delaware. As Governor, Markell chaired national initiatives with both the National Governors Association (NGA) and later the Council on State Governments (CSG). Both the Better Bottom Line Initiative of the NGA and CSG’s Work Matters Report focused on fighting stigmas, supporting strong public policies and using best practices at the state level. RespectAbility, like most governors and employers, emphasizes the critical link between education attainment and workforce development. “Employment rates only tell part of the story,” said Philip Kahn-Pauli, Policy and Practices Director at RespectAbility, “Educational attainment is critical to the success of youth with disabilities because the jobs of the future require technical education and skill training.” Colorado had an overall high school graduation rate of 78.9 percent in 2016, but only 57.2 percent of the students with disabilities graduated. Yet where challenges remain, there are commit state organizations leading the way on improving these outcomes. The Colorado Cross-Disability Coalition is the state’s leading voice on disability issues working everything from developing community leaders to promoting community supports to help Coloradans with disabilities. Such organizations, and others, are critical partners in the drive to fight stigmas and advance opportunities for people with disabilities.